Two Apple Store Geniuses examining the new iPad Tablet Macs, pondering the buyer demographic. (Trekkies, lining up to make the first purchase). I’m sure you’ve heard the rumors and buzz about Apple’s new product launching later this month, the Mac Tablet Pc. It could be named the”iPad” or “MacTablet” or “Table-mac” or “Macblet” or maybe even “iPod Sr.”. Whatever the name, it proves to be a juicy rumor that could add some exciting functionality and a bit of sexiness to the spartan Tablet PC Market. I drew this cartoon up in pretty much my “go-to” style. Pencil, then inked with my Mont Blanc Platinum fountain pen. Then scanned, colored in Photoshop and Corel Painter 11. Please, as always, feel free to share and distribute. Artistic Objective: Convey the possibility Trekkies (Star Trek Fans) could be the most excited demographic group about a sleek tablet Mac that is as close to Television Technology as produced so far. Apple should get William Shatner in the Commercials! Convey the possibility Trekkies (Star Trek Fans) could be the most excited demographic group about a sleek tablet Mac that is as close to Television Technology as produced so far. 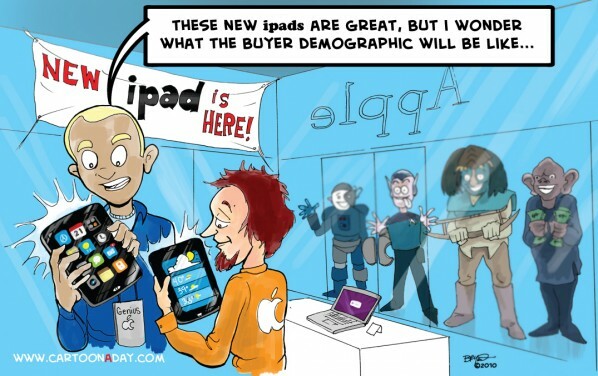 Inspiration: New Apple iPad, Trekkies, Apple store Geniuses, and demographic trending. Process: Scanned with flatbed scanner, colored in Adobe Photoshop™ and Corel Painter 11™.